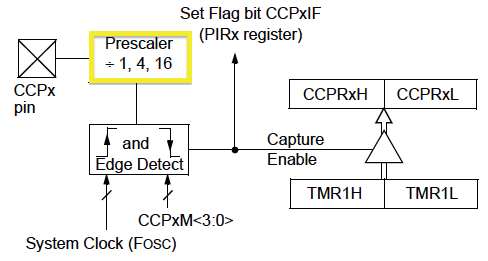 The prescaler can delay reaction to an event on the CCPx pin. The capture of the Timer1 value can be delayed to capture on the 1st edge (falling or rising), the 4th edge (rising only), or the 16th edge (rising only). These three prescaler settings are determined by the CCPxM<3:0> bits of the CCPxCON register. Whenever the CCP module is turned off, or the CCP module is not in Capture mode, the prescaler counter is cleared. Any Reset will also clear the prescaler counter. Switching from one capture prescaler to another does not clear the prescaler and may generate a false interrupt. To avoid this unexpected operation, turn the module off by clearing the CCPxCON register before changing the prescaler.